Kayla Hammergren, 22, donated bone marrow which was used to help James Strejc, then a 2-year-old battling leukemia. When Kayla Hammergren signed up as a bone marrow donor in 2013, she doubted she would ever get a call to donate. Two years later, on Sunday at the Chestnut Hill Reservoir, she got to meet the 4-year-old boy whose life she saved. 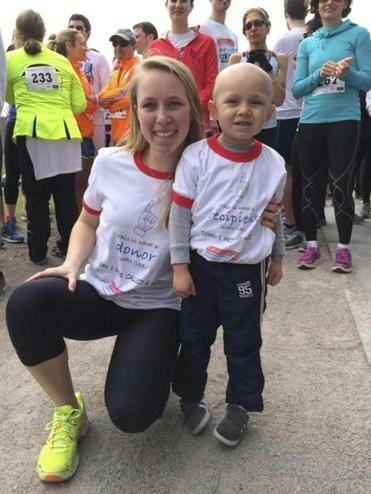 Five months after signing up for the bone marrow registry, she was matched with a 2-year-old boy suffering from leukemia. Hammergren, a 22-year-old Boston College student, donated her marrow through The Gift of Life Bone Marrow Foundation to young James Strejc. “It was an automatic yes for me; a no-brainer, really,” she said. If anyone she loved had needed a transplant, Hammergren said, she hoped a stranger would step up and do the same. The foundation mandates a one-year waiting period before donors can meet with recipients. Before Sunday, Hammergren and James had exchanged letters (his came with a little parental help) that were vetted by the foundation, and the two finally met Sunday at the Gift of Life’s inaugural Boston 5K Walk for Life. The morning was beautiful and sunny at the walk’s 8:30 start time, Hammergren said, though the weather was turning slightly cloudy. The volunteers joked that they had karma working for them. And James was bursting with enthusiasm, she said. “I assumed he wouldn’t have a ton of energy, since he was still recovering,” Hammergren said after the event and a long lunch with James. “He ran almost an entire lap around the reservoir,” she said. James and Hammergren were joined by other marrow donors and participants at the event, which was intended to raise money to help match more donors and possible recipients. Each swab costs $60 to be processed, according to a Gift of Life Bone Marrow Foundation statement. Amy Glanzman of the foundation estimated $45,000 was raised Sunday. Hammergren will stay on the donor registry, which limits participants to two or three marrow donations before they are removed from the list for their own health. She said she would consider donating again if called to do so but would need to prepare herself mentally for the effort. Though giving marrow is notoriously painful, she said the process of donating felt more like a “hollow ache.” Emotionally, it was wrenching. The psychological struggle centered on her investment in the then-2-year-old boy battling a potentially fatal disease. The senior business management major said she broke down sobbing after receiving a call while she was in London telling her that James also needed a blood transplant. “I never thought about the emotional pull and how connected I would feel about this little boy I had never met,” she said. Correction: An earlier version of this story misstated how much each swab costs to be processed. The cost of each one is $60.